Exposure by Helen Dunmore was published in 2016. It’s a great read despite the fact that it has an uncomfortable atmosphere, and not just because she was writing about a character who had terminal cancer – as she had too. The setting is 1960 Cold War London where Paul Callington has a ‘hush-hush’ job at the Admiralty. He’s married with three children and he’s happy with his life. His wife Lily is a part-time teacher and is able to help out with paying for luxuries and despite the fact that he has come to realise that his career has just about come to a standstill he’s not really bothered by it. Paul lacks ambition and in all honesty is a bit dim and lacking in common sense, despite having a decent degree from Cambridge – or possibly because of that! When his older work colleague and old friend Giles has an accident and ends up in hospital he asks Paul to go to his flat and secretly take a file back to the office – a file that Giles should never have had at home. Loyalty to Giles makes Paul hesitate, he knows he should hand the file to his superiors and he also knows it’ll be hard to replace the file clandestinely. One stupid decision leads to Paul being arrested as a suspected spy and his wife and family are ostracised and have to leave their schools and home. Exposure is very like an updated version of The Railway Children in many ways with the three children – two girls and a middle boy and with a capable mother having to move to a rural location, and an innocent father in prison. But the atmosphere is more menacing with the family being in danger from the real spy. 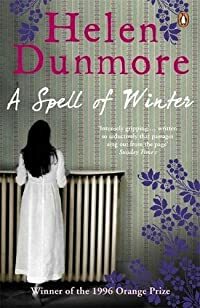 A Spell of Winter by Helen Dunmore won the 1996 Orange Prize and it is a great read if at times a bit shuddersome for any woman with a brother anyway. Catherine and her brother Rob live in the country in a large dilapidated old house which belongs to their grandfather. Money is scarce now but the family had been wealthy in the past. Their mother has abandoned them and they have no contact with her, their father is in a sanatorium as a long-term patient. Kate and Eileen look after the children with Kate in particular being more like a surrogate mother to Catherine. Their grandfather keeps them in the dark about both their parents. Why has the mother abandoned her children? There’s a ghastly character called Miss Gallagher who is supposed to be teaching the children but she all but ignores Rob whilst fawning on Catherine who despises her. Time passes and a wealthy next-door neighbour shows an interest in Catherine and Rob isn’t happy about that at all, which leads him to do something unspeakable. This book is a bit like Wuthering Heights with a hint of Jane Austen. There’s a lot more to the story than I’ve written about, I like to be quite sketchy about plots. The Guardian said of Helen Dunmore: An electrifying and original talent, a writer whose style is characterized by a lyrical dreamy intensity. The Greatcoat by Helen Dunmore was published in 2012. When I read the blurb I thought it would be a good book to read around about Halloween – and it was, I really enjoyed it. Having said that, this might be a disappointment to people who are really keen on very creepy tales, of the spine-tingling variety, they’ll probably find this a bit tame. The setting is Yorkshire, the winter of 1952. Philip Carey is a young doctor just setting up in his first job as a GP and he and his wife Isabel haven’t been married long. He has trawled the area looking for a place for them to rent, until they can afford to buy a house of their own. The post-war housing situation is desperate and he feels lucky to have found the two rooms with a tiny kitchen and shared toilet that they end up renting. Isabel isn’t so impressed though as the place is freezing, dark and depressing and as Philip doesn’t want her to work she’s stuck in it on her own while he works hard – often night and day. The landlady lives upstairs and constantly walks around, every footstep being heard downstairs, and Isabel is sure the landlady goes into their flat whenever she goes out to the shops. Philip is one of those people who hogs the bedclothes, one night Isabel wakes up freezing and decides to get up and look for something she can put over her side of the bed to warm her up. In a high cupboard she finds an old RAF greatcoat, it’s perfect for her purpose. The next night she’s woken up by the sound of stones rattling off the window and when she opens the curtains there’s an airman standing there and so begins a gentle haunting although Isabel thinks he’s just an airman who might have known someone who lived there previously. This is a very quick read, just a novella really because although it has 256 pages the margins are large as is the print. I think in what I think of as a normal paperback this would probably only have been about 90 pages. 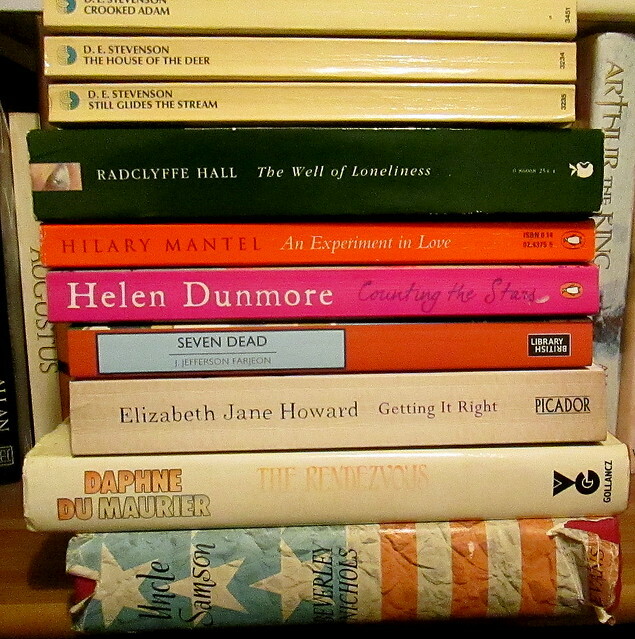 Sadly Helen Dunmore died earlier this year but she left behind twelve novels, so I have nine more opportunities to enjoy her company. 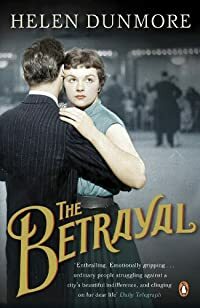 I recently enjoyed reading Helen Dunmore’s book The Betrayal, the first book of hers that I’ve read. So I was sad to read that she is seriously ill with some form of cancer that has a poor prognosis. She has written an article about facing mortality.What do we leave behind when we die? she asks. There’s a new book out about Raymond Chandler and his work called Raymond Chandler: The Detections of Totality by Fredric Jameson. You can read an article about it here. The author Elizabeth Strout writes about her working day here. The retired MP Roy Hattersley has written an article comparing Brexit with Henry VIII’s break with Rome. You can read it here. And just because I love Bogart and Bacall below is a still from The Big Sleep. The Betrayal by Helen Dunmore was first published in 2010 and it was long listed for the Booker prize. Howard Jacobson won the prize that year with The Finkler, I haven’t read anything by him, but I’m wondering if I would have enjoyed that one as much as The Betrayal. It’s the first book by Helen Dunmore that I’ve read, it was Judith, Reader in the Wilderness who pointed me in the direction of The Betrayal – and what a great read it was. Given the subject matter this was never going to be an easy or comfy read. The setting is mainly Leningrad and it’s 1952, Stalin is of course in power. Andrei is a young hospital doctor, married to Anna who is a nursery school teacher. They’ve been together for years, all through the siege of Leningrad and they feel lucky to have a two room apartment that they share with Anna’s much younger brother. Like everyone else they are constantly walking on egg-shells, knowing that there are spies everywhere, just waiting to denounce them to the communist authorities. Andrei is a specialist in childhood arthritis, but when one of his colleagues asks him to look at a child’s swollen leg joint he realises that it is something far worse, he suspects cancer and he knows that his colleague has just handed him a poisoned chalice, because the child is Gorya the ten year old only son of Volkov a man very high up in the secret police. Volkov is a name that strikes fear into everyone. Sadly it’s too late for Gorya, the cancer has spread and there’s no hope for him. Volkov has to hit out at someone and the doctors are the obvious targets for his rage, and so begins a nightmare for Andrei and Anna. The Betrayal portrays what seems to me to be a realistic view of life in the Soviet Union, just before the death of Stalin. Hundreds of thousands of people had been sentenced to death or sent to labour camps for life under Stalin’s rule. He had begun with the artists and writers, then moved on to the engineers, after that it was the doctors who were targeted and accused of being butchers and Volkov says ‘We are uncovering an international conspiracy of Zionists working as tools of the Americans, who directed these criminal saboteurs.’ That’s a dictatorship for you and they’re all run on much the same principles! Thankfully in reality the death (murder?) of Stalin meant that the doctors and many others who had been imprisoned under Stalin’s regime were eventually set free. This isn’t the sort of book that you an say is an enjoyable read but it’s a real page turner.